While leather/Kydex holsters have been around for a few years, the Versacarry Compound just might be the first true hybrid. In fact, this holster features leather actually wrapped around a Kydex frame. Versacarry claims the Compound is a true hybrid unlike any other. “The unique design allows all of the comfort of a leather holster with the structural properties of a Kydex holster,” said Versacarry in a statement. To make the Versacarry Compound, the company wrapped a Kydex frame with premium water buffalo leather. The holster has leather plied on both the inside and outside of the Kydex. This prevents the handgun from ever touching the Kydex. However, it still has the structural stability that keeps the holster from collapsing when the gun is drawn. It even has an exposed track of Kydex recessed in the leather to avoid the front sight from snagging. All together, this provides a smooth yet fast draw, and extremely easy re-holstering. Additionally, the design prevents any type of unwanted stretching, meaning this holster is both comfortable and durable. Now the Versacarry Compound is available as both an inside the waistband and outside the waistband holster for both right- and left-hand shooters. 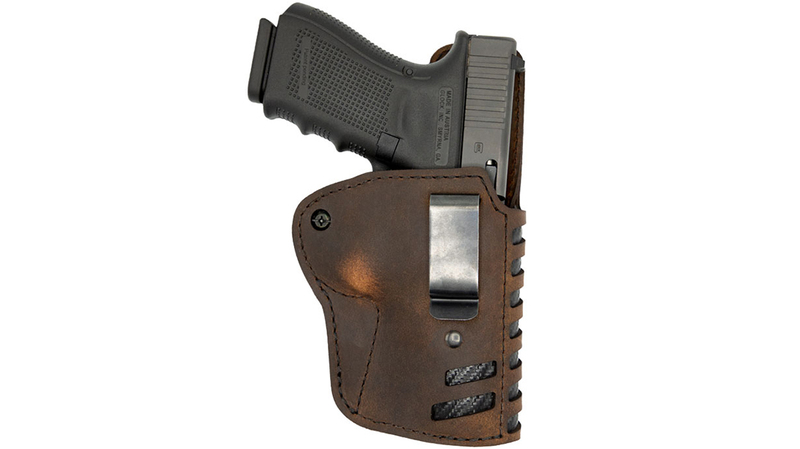 Both holsters features double-ply backing and an adjustable retention system. However, the OWB also features sturdy leather loops, and a forward cant that makes drawing much easier. The IWB comes with a metal clip for easily attaching or removing the holster. These holsters also come in two different versions. Shooters can choose between black leather with forest green Kydex and distressed brown leather and black Kydex. Sure, hybrids have been around for a while, but is strapping some Kydex to leather truly a hybrid? The Compound creates a new type of holster that truly combines the comfort of leather with the rigidness of Kydex. For more information about the Versacarry Compound Holster, please visit versacarry.com.